June 18th – THE WORLD OF THOMAS HARDY THROUGH OUTSTANDING CONTEMPORARY PAINTINGS by Elizabeth Merry. I hope to see you at 10.15/10.30 am at the Church Hall Milford on sea on either or both of these lecture days. (please telephone Ann Dence for tickets on 01590 645 421). Angela Findlay spoke passionately and extremely eloquently on Germany’s post World War 2 culture of apology and atonement through art. In 2009, following in the footsteps of her Wehrmacht General grandfather and accompanied by her grandmother, Angela traced the route of Operation Barbarossa. This inspired her to study the art and sculpture of post war Germany commemorating the atrocities carried out by the National Socialists. Her Anglo-German background enabled her to examine the intergenerational impact that intense feelings of guilt and shame have had on subsequent generations of Germans. Speaking from the heart the talk was all the more interesting. She showed artwork by the likes of Gerhard Richter and Anselm Kiefer (recently the subject of a Royal Academy exhibition). Numerous other slides showed counter-memorial sculptures and art installations such as Stih and Schnock’s 1994 Bus Stop (red buses with concentration camps on the destination boards), Eisenman’s 2005 Memorial to the Murdered Jews of Europe, Melian’s 2010 website Memory Loops, Elmgreen and Dragset’s 2008 Memorial to Homosexual Victims of National Socialism and Demnig’s Stolperstein or Stumbling Stones (small concrete cubes with a brass plate inscribed with the name and life dates of victims of Nazi extermination or persecution). Throughout the excellent talk, Angela emphasised the lack of ostentation in these very modest memorials. Christopher Bradley took us on a journey which started with the first magi who were Zoroastrian scholars from around 1500 BC and who specialised in studying the night sky and making predictions – early astrologers! Linking this with the various trade routes, Bradley explained how the best quality frankincense and myrrh (tree resins) came from the Dhofar region between Muscat and Oman, and Yemen. 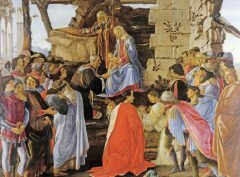 Following numerous modern astronomers, his suggestion for the “Star of Bethlehem” was that it was probably due to an alignment of Jupiter and Saturn which occurred three times in 7BC. We then followed the bones of the Wise Men from the Hagia Sophia basilica in Constantinople to Milan, before they arrived in Cologne along the River Rhine (“I saw three ships”) in the 12th century AD where they now lie in The Shrine of the Three Kings, a gilded sarcophagus in Cologne Cathedral. 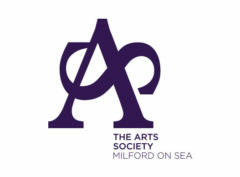 The next lecture for The Art Society – Milford on Sea, will be on Monday January 15th 2018 to be held as usual in the Church Hall at 1030. 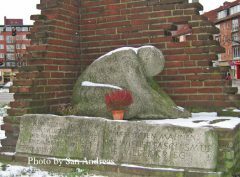 It will be an acclaimed lecture by Angela Findlay entitled “German World War Two Memorials”. 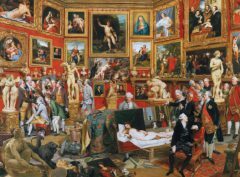 Why not visit www.artuk.org to discover over 200,000 publicly owned oil paintings by over 28,000 artists from 3,250 venues across the UK – and all from the comfort of your own home! Mary Rose Rivett-Carnac’s talk gave us a wonderful insight into extensive photographing and cataloguing of the work of Art UK since 2003. Watch out for the arrival of the first of 17,000 publicly owned sculptures in early 2018. As the Arts Society nationally approaches its Golden Jubilee Year in 2018, our society re-launched our own Young Arts activities with our 40th anniversary ceramic leaf project at Milford Primary School led by local potter Jane Saville. This was followed, by the Magic Lantern presentations, introducing children to classic works of 19th and 20th century painting. Our third project was led by a distinguished craftsman, John Browning, who taught the children the principles of kite making and flying and then helped them each to make their own, to be raced across the school field in a kite flying competition. Our most recent project, taking place now, was the sponsorship of a day of puppetry. This time the children have enjoyed seeing and taking part in a traditional Punch and Judy Show led by Bertie Pearce and then creating their own sock puppet characters, with a name, a voice and a story to tell. Each project has been agreed with the school to give the children experiences not otherwise provided for in the curriculum, and connected in some way to their day-to-day teaching and learning. This partnership with our local Primary School has allowed us to give ninety children each year an opportunity in the arts that helps us to meet our charitable aim as a Society of extending and enriching arts education for young people. Our next lecture is on Monday November 20th at the Church Hall All Saints Milford on Sea SO41 0SJ entitled “Uncovering the Nation’s hidden Oil Painting Collection” by Mary Rose Rivett-Carnac. All are most welcome. Ciceroni Travel founder, Dr Tom Duncan, gave the Milford on Sea Arts Society a wonderful roller coaster ride through 18th century Dublin. His excellent presentation, illustrated with photographs, etchings and paintings, took us to the James Gandon’s Customs House (now Irish Government offices), Edward Pearce’s Parliament House (currently owned by the Bank of Ireland), St Patrick’s Cathedral (where Jonathan Swift was Dean), Trinity College Dublin (with its spectacular Long Library and home of the Book of Kells), the fascinating Casino at Marino (William Chambers’ wonderful trompe l’oeil folly) and many more of the buildings in Dublin, “the black, dark pool” (dubh lind, in Gaelic). Question time led us into much of Ireland’s complex and complicated history but, as Dr Duncan said, that is the subject for another lecture. 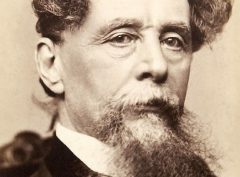 A beautifully articulated biography of the author and how his literary characters developed out of Dicken’s own life and his acquaintances. Bertie Pearce gave several readings in his totally individualistic style and had the audience thoroughly amused and entertained throughout. Our first Lecture meeting of the new season took place last Monday September 18th – a wonderful lecture by Bertie Pearce: Dickens – the Man, His Life and his Characters. Bertie is an enthusiast for his many subjects which include Acting and Conjuring. His memorable lecture included characterisations of many Dickens personalities such Mr Wackford Squeers and Uriah Heep. We were delighted to welcome 70 members and, most importantly, 14 visitors. All were bowled over by his infectious enthusiasm. Such are Bertie’s gifts that he is going to lead our Young Arts Project with Milford school making and acting with puppets! 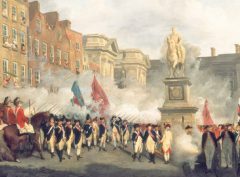 Dear Readers – do come to our next carefully selected lecture by the acclaimed Tom Duncan entitled ‘Life and Art in Georgian Dublin’ which will be in Milford Church Hall on Monday October 16th at 10.00 for 10.40. A small donation from visitors is encouraged.